Nocturne Serif is a geometric serif typeface created by Mateusz Machalski and published by Borutta Group which comes in 10 weights (from XThin to Black) and italics, clean geometrical shapes, high contrast and over 750 glyphs. It merge well on branding, headline, magazine, poster, web use etc. 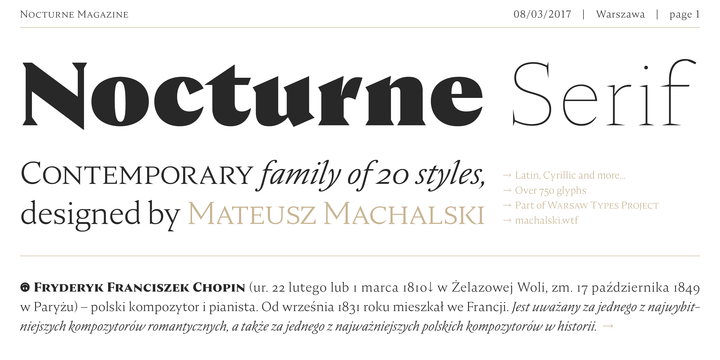 The night is closer with Nocturne Serif! A font description published on Tuesday, April 11th, 2017 in Borutta Group, Fonts, Mateusz Machalski by Alexandra that has 3,650 views.